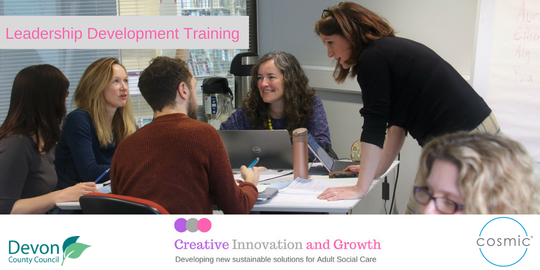 The Creative Innovation & Growth (CIAG) Programme supports Adult Social Care businesses and organisations in Devon. There are three elements within this package: Grants Fund; Business Support; & Leadership Development Training. The overall aim of the CIAG Programme is to increase sufficiency in the ASC sector across Devon by supporting the market (including personal, residential and unregulated care) to grow, develop and diversify. Devon County Council have commissioned Cosmic to deliver free Leadership Development Workshops for the managers and owners of ASC businesses in Devon, with the aim of developing Leadership & Management skills and thereby increasing sufficiency and in the sector. These workshops will run from Spring 2019 until March 2020. These workshops are designed to help you as a ASC manager to support your staff and run your business more efficiently. Any eligible ASC organisation in Devon which feels it would benefit from Leadership Development can apply to attend these workshops. As mentioned, the content of the training is specifically designed for managers and owners of these businesses (Nominated Individuals and Registered Managers, for example). The full training programme consists of 10 module workshops, each with a different theme and focus. Delegates will benefit especially from attending all 10 modules - but we know that your time is precious and this may not be possible. The more you can attend - the better. We are repeating all workshops at four locations across the county: Honiton, Okehampton, Bideford & Newton Abbot. You are welcome to move between locations if you are unable to attend dates at your most local venue. Spaces are limited and must be booked through the Eventbrite booking system. This workshop looks at leadership, management and setting strategies and objectives. It will also cover managing your workforce and operations. Central Devon - 6/6/2019: Click here for The Ockment Centre, Okehampton. North Devon - 12/6/2019: Click here for Durrant House Hotel, Bideford. South Devon - 19/6/2019: Click here for Courtenay Centre, Newton Abbot. East Devon - 18/7/2019: Click here for East Devon Business Centre, Honiton. This workshop covers models, systems and frameworks for quality assurance; along with CQC requirements and planning for inspections. Central Devon - 2/7/2019: Click here for The Ockment Centre, Okehampton. North Devon - 3/7/2019: Click here for Durrant House Hotel, Bideford. South Devon - 24/7/2019: Click here for Courtenay Centre, Newton Abbot. East Devon - 15/8/2019: Click here for East Devon Business Centre, Honiton. This workshop looks at organisational culture and its impact on behaviour and performance. Central Devon - 6/8/2019: Click here for The Ockment Centre, Okehampton. North Devon - 14/8/2019: Click here for Durrant House Hotel, Bideford. South Devon - 21/8/2019: Click here for Courtenay Centre, Newton Abbot. East Devon - 12/9/2019: Click here for East Devon Business Centre, Honiton. We take a look at new trends in technology, new innovations in systems and processes and developing attitudes towards tech. Central Devon - 3/9/2019: Click here for The Ockment Centre, Okehampton. North Devon - 11/9/2019: Click here for Durrant House Hotel, Bideford. South Devon - 18/9/2019: Click here for Courtenay Centre, Newton Abbot. East Devon - 10/10/2019: Click here for East Devon Business Centre, Honiton. This workshop focuses on stakeholder management, co-design and building relationships. Central Devon - 1/10/2019: Click here for The Ockment Centre, Okehampton. North Devon - 9/10/2019: Click here for Durrant House Hotel, Bideford. South Devon - 23/10/2019: Click here for Courtenay Centre, Newton Abbot. East Devon - 7/11/2019: Click here for East Devon Business Centre, Honiton. This workshop looks at the importance of supporting wellbeing and mindfulness with your staff. Central Devon - 5/11/2019: Click here for The Ockment Centre, Okehampton. North Devon - 6/11/2019: Click here for Durrant House Hotel, Bideford. South Devon - 20/11/2019: Click here for Courtenay Centre, Newton Abbot. East Devon - 5/12/2019: Click here for East Devon Business Centre, Honiton. This workshop focuses on managing your team, setting targets and monitoring actions and activities. Central Devon - 3/12/2019: Click here for The Ockment Centre, Okehampton. North Devon - 11/12/2019: Click here for Durrant House Hotel, Bideford. South Devon - 18/12/2019: Click here for Courtenay Centre, Newton Abbot. East Devon - 9/1/2020: Click here for East Devon Business Centre, Honiton. Central Devon - 7/1/2020: Click here for The Ockment Centre, Okehampton. North Devon - 15/1/2020: Click here for Durrant House Hotel, Bideford. South Devon - 22/1/2020: Click here for Courtenay Centre, Newton Abbot. East Devon - 13/2/2020: Click here for East Devon Business Centre, Honiton. This workshop looks at why you need change and how to manage it. Central Devon - 4/2/2020: Click here for The Ockment Centre, Okehampton. North Devon - 12/2/2020: Click here for Durrant House Hotel, Bideford. South Devon - 19/2/2020: Click here for Courtenay Centre, Newton Abbot. East Devon - 12/3/2020: Click here for East Devon Business Centre, Honiton. This workshop looks at strategies and approaches to marketing, customer insights and journeys. Central Devon - 3/3/2020: Click here for The Ockment Centre, Okehampton. North Devon - 11/3/2020: Click here for Durrant House Hotel, Bideford. South Devon - 18/3/2020: Click here for Courtenay Centre, Newton Abbot. East Devon - 26/3/2020: Click here for East Devon Business Centre, Honiton.